Togakushi Shinobi Apparel: Hachigane is a Head Armor in Nioh. 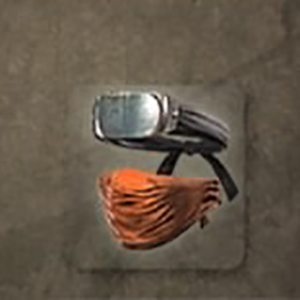 "A cloth headband that incorporates an iron plate. Fabric also covers the nose and mouth to suppress the sound of breathing and help the wearer avoid detection. This apparel was worn by the Togakushi ninja, whose base was located at Mount Tokagushi in northern Shinano province (present-day Nagano prefecture). Sarutobi Sasuke, who travelled the lands in order to master the ninja arts, trained rigorously on the precipitous crags of Togakushi in order to hone his skills"